Have you been watching the new season of the Real World: Cancun? Well then you must have noticed the amazing suite the roommates are staying in at the Melia Resort ME Cancun (52/998-881-2500, Boulevard Kukulkan, km. 12 Cancun, Mexico 77500) in Mexico’s Quintana Roo state. The suite that will undoubtedly become infamous as the season rolls on, is now open to the public, so organize a group trip and head to Cancun where you can live like the reality stars of MTV. SuiteME is one of the more luxurious Real World houses at 9,757 square-feet, featuring a flat screen, plasma TV that can also be used as a computer with the suite’s complimentary internet access. iPods are also welcome in the suite, as there is a docking station and a Nintendo Wii and Rockband setup. And how about that fish tank? A circular tank, set inside a seating area; the tank allows for an up-close encounter with the fish. What would the Real World house be without the Confessional. The Confessional is usually the place of controversy between the roommates, where they bare their souls, and say what they really think about each other. As a guest in SuiteME you too can share your secrets and get a feel for what it’s like in the intimate hideaway. Speaking of relaxation, as a registered guest you can get a complimentary massage, one per person, while on your vacation. SuiteME features a laundry area, but if you’re feeling like taking a break from chores the resort offers a complimentary laundry service prior to checkout. The phone room is another prominent feature throughout the series, and SuiteME uses a classic rotary-dial telephone, blending traditional styles with the contemporary, resulting in a chic dÃ©cor. While on the phone you can lounge on the daybed in the phone room, enjoying the indoor garden, while chatting away about your crazy companions. Other features of the suite include six showers and six bathrooms, a deck, a 10-person hot tub, a pool table and fully stocked bar. The resort also offers transportation to and from the airport, included in your reservation. With the in-suite offerings you might be thinking, why would I ever want to leave my room? To explore the resorts other amenities of course! As soon as you look out from the deck of your bi-level suite and experience the gorgeous views of the ocean, which blend right into the resort’s infinity pool, you will want to investigate everything Melia has to offer. Not only is the resort an MTV favorite, but Maxim loves them as well, as ME Cancun is the first Maxim Beach Club. When you venture out of the sanctum of your suite, check out the Maxim Lounge, or the Asian bistro, Silk. Other restaurant offerings at the resort include Salt, a Mediterranean option, the cyber cafÃ© E-Space, and the Beach House which offers lighter fare like quesadillas and tacos. Although lounging poolside is relaxation enough, the resort also features YHI Spa, where guests can get beauty treatments and massages. 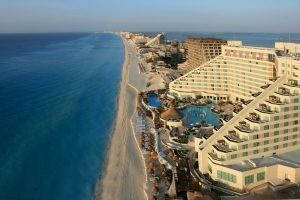 Another highlight of the resort is that if you friend ME Cancun on social networking sites like Facebook or MySpace you are eligible for the ME Cancun Social discount. With this discount you get the ME Social Network Upgrade automatically when you book a room just for being their friend. The discount entitles you to a free room upgrade, VIP access to bars and events, and a bottle of wine or champagne. SuiteME comes at a hefty price of US$15,000/N so taking a large group and splitting the cost is recommended, as the suite sleeps at least 8. To make a reservation or for more information on Melia Resorts call 866/43-MELIA. Don’t forget to check out The Real World: Cancun Wednesday nights at 10pm on MTV, to scope out SuiteME.